How Does the ProCell MicroNeedling System Work? 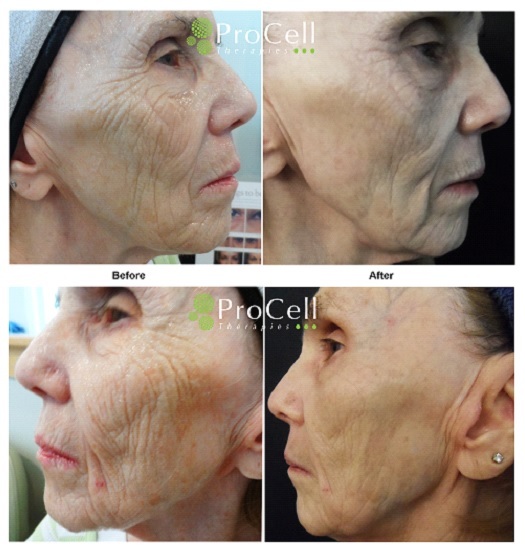 The ProCell Pen creates invisible micro-perforations in the skin to stimulate cells known as keratinocytes to increase production of new collagen and elastin. ProCell serums derived from human stem cells penetrate the channels created by MicroNeedling to enhance the production of healthy new skin. This in turn stimulates the release of epidermal growth factors without damaging the skin. Fine lines and wrinkles diminish over time, and skin looks and feels brighter, more luminous, and healthy. Perfect for wrinkles around the eyes, around the lips and for acne scarring (see photo above). The union of MicroNeedling and the use of cutting edge growth factor serums, derived from human stem cells, dramatically improves the appearance of skin to a degree previously attainable only through more aggressive and expensive procedures.